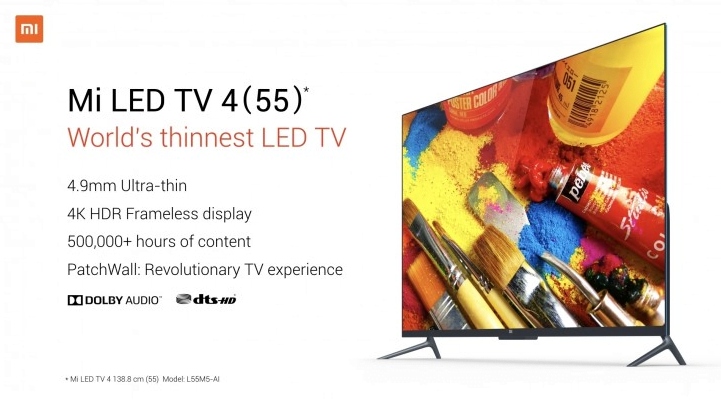 The Chinese smartphone maker, Xiaomi launched its Mi TV 4 in India on Wednesday, along with Redmi Note 5 and Redmi Note 5 Pro smartphones. The launch marks Xiaomi first foray into Indian television market. 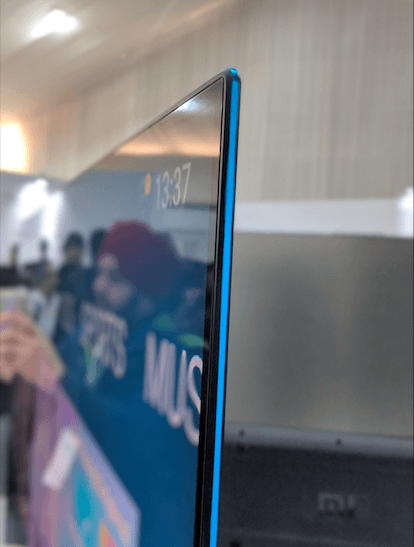 The Mi TV was earlier solely available in the Chinese market since May 2017, and Xiaomi even apologised to its fans at the launch event for bringing the Mi TV to the Indian market this late. Claimed to be world’s thinnest LED TV, the Xiaomi Mi TV 4 comes with a thickness of 4.9mm. The Mi TV 4 was launched in a single 55-inch variant for Indian customers and is notably called Mi LED TV 4. The Mi TV 4 in India sports a 55-inch LED display panel with 4K 3840 × 2160 pixels resolution and HDR10 support. The smart TV is powered by a 64-bit quad-core Amlogic Cortex-A53 SoC clocked up to 1.8 GHz paired with Mali-T830 GPU. The CPU is coupled with 2GB of RAM and features 8GB of storage. As for the connectivity options, Xiaomi Mi TV 4 packs three HDMI 2.0 ports, an Ethernet port, an S/PDIF port, dual-band Wi-Fi 802.11ac and Bluetooth 4.0. The Mi TV 4 is bundled with 11-button Mi Remote that works with the TV and Set Top Box, using the Mi IR cable. The company also said the TV sports Dolby DTS Cinema Audio with two 8W duct inverted speakers. The Smart TV runs Xiaomi’s own AI-powered PatchWall UI which gives personalised recommendations based on your search preferences. As for the pricing details, Xiaomi Mi TV 4 is available at Rs 39999. Launch offers for first three months include 3-month to Sony Liv and Hungama Play, Mi IR cable and on-site installation worth Rs 1099 for free. The Mi TV 4 will be available to buy from Mi.com, Flipkart, and Mi Home stores, starting February 22. Xiaomi also launched its Redmi Note 5 and Redmi Note 5 Pro at the event. The biggest change is the trendy 18:9 aspect ratio display and larger 5.99inch screen. The Redmi Note 5 is powered by Snapdragon 625 SoC paired 3/4GB of RAM. The Pro model comes with Snapdragon 636 SoC paired with 6GB of RAM and dual rear camera combo. The Redmi Note 5 will start at Rs 9999 while the Pro model starts at Rs 13999. Which brand do you represent ? Happy with the much cheaper BPL led tv. Combined with Amazon Fire Stick, you dont need anything else. Awesome sound and picture. Smart tvs are way more suceptable to malfunction because of the load on motherboard. Better to buy a regular led tv and use firestick or chromecast.